CARROT CAKE ( D. Trimmer) Tetraploid (Gold Baron x Patsy Cline) 35” EM Re..Ev. 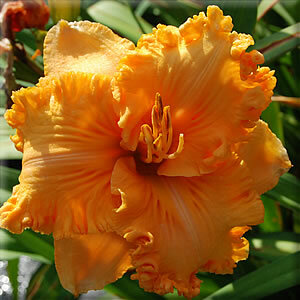 5 ½” This self colored, intense carrot orange, embossed bloom is always eye catching and a delicious. Three way branching with about 20 buds for this parent of intense orange gold offspring. Blooms are round, wide segmented and absolutely self colored. 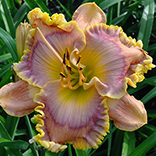 I believe the new intense gold and oranges are perhaps our best color in the world of daylilies and we need many more of them. My New Jersey friend, Pete Postel, got me onto these colors almost 20 years ago and I’m hooked.